It’s with great sadness that the UK’s been hit with more tragedies than imaginable recently. While they’re something no-one would ever wish upon, sadly, they happen, and when they do it’s important to handle the situation with respect and care. Dealing with a tragedy is never easy and there’s no such thing as a one shoe fits all sizes formula. However, there are approaches you can implement to handle any situation as best you can. Jenny Ware, our HR Business Partner, has six great tips to help you through any tragic event. Policies are great for providing guidance on how situations should be dealt with, but when emotions are heightened it’s important to remember that you’re dealing with human feelings – which requires a human approach. Take the time to talk to employees and get an understanding of how you can cater to specific needs – deviate from your policy if needs be. Some people feel scared to speak to people who’re dealing with a bereavement or tragedy, but this avoidance can leave affected employees feeling even more isolated, at a time when they need support most. When you’re talking to them, make sure you’re portraying genuine interest and care. If the employee’s off work, maintain regular contact and agree on the frequency of catch-ups – make sure you get the balance right though, too much contact can be intrusive. It’s instinct to want to help and fix someone’s problem by telling them what they should do, but this isn’t always the best route to go down. Everyone’s different, and what you think will help might not work for someone else. Instead of pushing your solutions on them, simply give them time and space to talk – just listen. Depending on the type of tragedy you’re dealing with, it may impact all or part of a team, or a select individual. While helping affected employees, bear in mind the wider impact it could have on others. This isn’t to say you need to give everyone time off, but just acknowledge the situation and give everyone an open forum to talk about, digest and process it. No two people are the same, and everyone has their own way of dealing with tragic events. While some employees might need time off work, others might choose to return to work quickly as a way of distraction. If affected employees do return to work soon after a tragic event, it’s incredibly important that line managers recognise this doesn’t mean they’re necessarily okay, and adjustments may need to be made in terms of their performance. 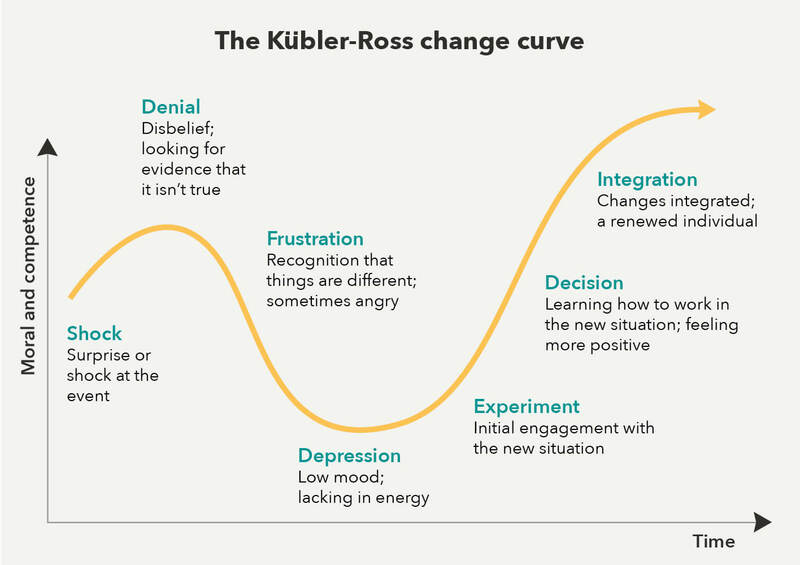 Research has identified a pattern of seven key phases people go through after they’ve experienced a loss, bereavement or significant change: shock, denial, frustration, depression, experiment, decision and integration. People go through these stages at different paces, and being able to identify which stage an employee is at can play an important part in understanding how you can best help them. In her last role at a Manchester-based business, Jenny was directly involved with helping employees through the aftermath of the MEN Arena bombing. She soon established none of the employees or their family members had been directly affected by the tragedy, but the overwhelming sense of loss and shock within the business was palpable. In a mainly male environment, it became apparent that some employees were struggling to process what had happened and how close they and their families were to it, but no-one was talking about it. To remove the stigma of showing emotions, Jenny and her team stepped in and deliberately instigated conversations during the course of the day, to encourage people to air their feelings and concerns. There was an instant difference, and it made people feel much more at ease when it came to articulating their feelings, and knowing others were feeling the same way provided a great sense of comfort. Just like that, the bubble of the situation was burst, and it helped people to get on with their day job. If you’re in need of help when it comes to handling difficult situations and conversations, we’ve a team of highly qualified HR experts here to guide you through. Just get in touch or give us a call on 0345 844 1111 for more information.